Even though there is still time to catch a basketball of hockey game in the US, consider this an early list for your event travel plans for the summer concert season. Often times, the best hotel option is the one as close to your event as possible, if not on-site. Which is why we give you a list of 10 of the best hotels conveniently located next to a major arena. With the Omni connected to State Farm Arena via the CNN Center, your event and many restaurants can be accessed without going outside. Within walking distance are many other tourist attractions including the CNN Center, College Football Hall Of Fame, Georgia Aquarium, The National Center for Civil and Human Rights and World of Coke. The Omni truly is THE place to be for out-of-towners. On top of convenience it offers luxury and comfort at every turn. Start your day at the Serenity Spa, stroll the many sites in the vicinity before imbibing a cocktail overlooking Centennial Olympic Park in the hotel’s bistro & lounge. Relaxed and ready for night out at the arena. At this downtown, urban hotel, where dining and entertainment venues are literally a stone’s throw away, finding something to do couldn’t be easier. But with Nationwide Arena up the street, there’s a good chance you could catch a basketball, hockey, arena football game or concert no matter what time of year it is. If you happen to enjoy local art, the hotel also boasts over 150 original pieces from area artists. In a nod to Sacramento’s past as commercial center of the gold rush, this hotel has a gilted touch through and through, and to tie it’s past to the state’s current reputation as a protectorate of the environment, this boutique hotel was named after Judge Lorenzo Sawyer, who ruled that mining companies couldn’t discharge their sediment into the river, which is considered California’s first environmental law. Isn’t that fun to know. One of the best features of this hotel, is the on-site dining options, including Revival, the rooftop lounge which offers unique cocktails and bar food and stays open for Kings home games and concerts, Echo & Rig, a butcher shop and steakhouse, and Punch Bowl Social, the endlessly fun adult event space & bar that’s popping up in entertainment districts around the country. The 02 is one of the most iconic arenas in the world, and when you have a hotel as exceptional as the Intercontinental attached to it, we couldn’t leave this one out. Attached to the 02 via covered walkway, the Intercontinental is a logistical slam dunk for your event travel. Not to mention, the surrounding area is great for those interested in live music, riverside walks or an active nightlife. When it comes to hockey in America, few cities have more credibility than Pittsburgh. Playoff hockey is no joke here and is a highly recommended experience, albeit an expensive one. The Cambria Hotel & Suites is the official hotel of the Pittsburgh Penguins, and it’s spacious rooms make for the perfect home base on a visit to Pittsburgh. With local shuttle service, it’s a cost effective option for visiting shopping districts, restaurants or the many galleries in the booming local art scene. Minneapolis is home to one of the most vibrant music scenes in the country, and the Loews Minneapolis Hotel places itself right in the middle of it. Not only is it across the street from the Target Center, but is a block away from the famous First Avenue rock club, and the cavernous Skyway Theatre. If you don’t happen to be in town to watch the Timberwolves in season, you could easily catch a different musical act within walking distance and Skyway access of the Loews. After all those late night’s nothing will feel better than the rain shower head in and a night’s rest on their comfy pillowtop beds with Frette Italian sheets. This is the outlier of the list on account of the lack of familiarity, by most, with the hotel chosen and the city it’s located in, but it is important that both be brought to people’s attention. First, Premier Inn is a budget hotel chain in Germany, UK and Ireland. You will be hard pressed to find a hotel in Europe with more space or more comfort that is this friendly on your wallet. It’s modern décor and amenities doesn’t feel like you’re skimping either. Leeds is a beautiful city of friendly people, excellent food and surrounded by lush Yorkshire countryside. It’s lack of a top tier football team might have something to do with it’s lack of appreciation. The First Direct Arena is a modern venue (opened in 2013) that doesn’t house any regular sporting events, but does host a variety of events from darts to boxing and combat sports in addition to premier entertainment events. Now, that Las Vegas is officially a sports town and has a major standalone venue, it has to be included on a list like this. The state-of-the-art T-Mobile arena is home to the NHL’s Golden Knights and has quickly become THE place to host a major prize fight. New York-New York is far from the best hotel in Las Vegas, but it does have a roller coaster and it might be the most family friendly and affordable option on the strip, the fact that it’s across from the T-Mobile arena is added value. Sometimes all you want is a good bed to sleep in, and with their signature Serenity beds, the Hilton’s got you covered. But, when you stay right in the thick of things at this Downtown Nashville Hilton, you will have every reason not to be sleeping in your room. 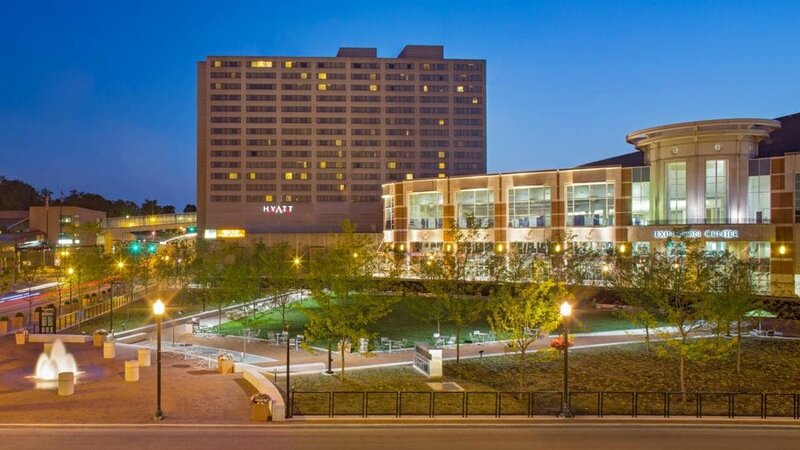 This Hilton is across a park from the Country Music Hall of Fame, and across the street from Bridgestone Arena. The surrounding neighborhood has so many restaurant, shopping and entertainment options, making decisions could cause anxiety.